Team Fusion started 11 years ago in a small garage in Nixa, MO. In 2013 we moved into Springfield, MO so we could accommodate our growing academy. Over the years Fusion has evolved into one of the premier gyms in the state with a wide variety of martial artists ranging from 4 year old kids to professional mixed martial artists and everywhere in-between. We are proud to be a Zenith Brazilian Jiu-Jitsu affiliate led by Professor Robert Drysdale who is a six-time world champion. 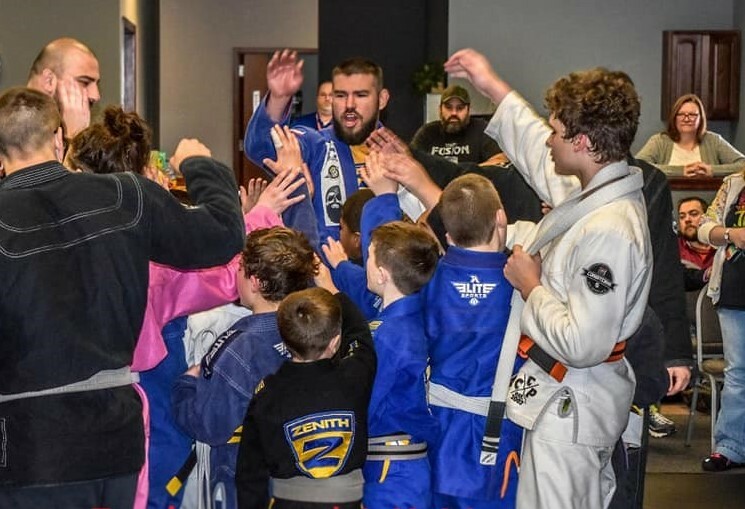 Brad Montgomery is a Black Belt under Professor Drysdale and runs the Brazilian Jiu-Jitsu and MMA program at both the Springfield, MO and Bentonville, AR locations. We have several colored belts that are trained and certified to help coach the kids' program and also offer private lessons. Brazilian Jiu-Jitsu is not only a great activity that keeps you physically active, but it also helps improve your mental health and mood as well. Fusion was founded on the principle that Jiu-Jitsu is for EVERYONE no matter size, shape, age or athletic ability EVERYONE is welcome at Team Fusion. Come and visit us at 228 S Sunshine Suite E in Springfield, or just give us a call at 417-595-4423. Black belt in Brazilian Jiu-Jitsu under Robert Drysdale Zenith Affiliation. Brad started his training in Brazilian Jiu-Jitsu in 2008 under Daniel Montanha where he earned his blue belt. In 2013 he started his own gym under Robert Drysdale as a purple belt. Brad has competed in Brazilian Jiu-Jitsu for over a 10 years now and his most notable wins in Brazilian Jiu-Jitsu competitions are placing third at Masters IBJJF World Championships and winning the New York BJJ Pro as a Brown belt in 2017. In 2018 he was bestowed his black belt by Professor Drysdale. He also has striking experience which started alongside his Brazilian Jiu-Jitsu training. He competed in MMA under Team Fusion Fight Team for two years. He currently holds a record of 5-0. He quit fighting in 2014 to focus full time on being a coach and growing Team Fusion. I'm the kid's class coach. I love working with children and helping better their lives. I have been doing Brazilian Jiu-Jitsu for a year and a half. I wrestled for 5 years. I love my dogs, family, floating on the river. I’ve been wrestling since I was 14, started MMA and Brazilian Jiu-Jitsu when I was 19. Fun fact I have never lost an MMA fight or a sack race! Tom Hooper has 25 years experience in the fitness industry and is a certified personal trainer, certified TRX and group fitness expert. Tom was nominated as runner up as fitness instructor of the year in 417 magazine in 2016 and has helped many people lose weight and live healthier lives. I've been training jiu-jitsu since 2012. I trained at 2 separate gyms before finally striking gold here at Team Fusion. I'm currently 2-1 as a MMA fighter a blue belt in both gi and no gi variants of jiu-jitsu. I pride myself on the fact I can interlock my toes as an added frustration for those who attempt to break my guard. I grew up wrestling and made the transition to MMA in 2016. I’m now a professional fighter, with a record of 2-1, and a purple belt in Brazilian Jiu-Jitsu. I'm from Cedar Rapids Iowa. I worked a normal job smoked a pack of cigarettes a day. I wanted to get in better shape so I started training in MMA. I caught on quick and did 3 amateur fights in 2008. I quickly went pro. Started taking training more seriously. I currently have over 20 pro fights and have fought all over the country. I started training in Muay Thai in 1993 while in highschool. I fought 82 professional Muay Thai fights, and have traveled the world training and fighting. I feel I have developed a system of Muay Thai very effective in Muay Thai and MMA . My friends call me The Massage Wizard. I've worked in a variety of settings as a massage therapist, and that has given me a vast pool of experience to help you get past your pain. I'll also work with you to help you find contributing factors to recurring issues so that you can reduce future injuries.